Over the past decade, realistic military training (RMT) has become increasingly important to train warfighters to engage in urban conflicts and asymmetrical warfare. This is particularly true of Special Operatives. For example, Marines with MARSOC recently partnered with several Marine Corps and other U.S. military units this past February in Unit Readiness Exercise RAVEN, which was designed to analyze and improve the units’ readiness to provide security and fight the Global War on Terrorism. MARSOC relies on such RMT exercises to “get their first opportunity to work with the types of supporting units and subject matter experts they will likely work with during a deployment,” according to MARSOC’s G-7 (training and education) Director. RAVEN took place in portions of Alabama, Mississippi and Louisiana. Members of MARSOC and the other Marines involved in the exercise practiced helicopter and vessel-borne insertions, CQB techniques, breaching, fast-roping and other skills they are likely to need when they could be deployed in populated urban environments. The MARSOC G-7 Director said they would never be able to conduct the kind of precision necessary in these exercises, without the cooperation and support of the local governments and communities where they take place. But such RMT exercises are not without controversy. Soon, members of USSOCOM will train with other U.S. Armed Forces, in a multi-state exercise called Jade Helm. The massive RMT exercise, is scheduled to be conducted from 15 July through 15 September, and is the most sweeping RMT exercise ever to be held on U.S. soil. It involves RMT exercises across many states, and has been designed to expose U.S. warfighters to the multiple environmental challenges they may face overseas. According to USSOCOM, Army Special Operations Forces will only train in five of the states taking part in the exercise: Texas, Arizona, New Mexico, Utah and Colorado, because of the diverse and difficult terrains found in these states. While USSOCOM conducts such RMT exercises all of the time, the size and scope of this operation has led some to speculate that US DoD is really planning for a U.S. invasion, or for martial law, rather than overseas operations. While there is no hard evidence to support such claims, there are legitimate concerns over RMT, such as the costs, and the inconveniences such exercises present to the populations within the areas in which they are held. 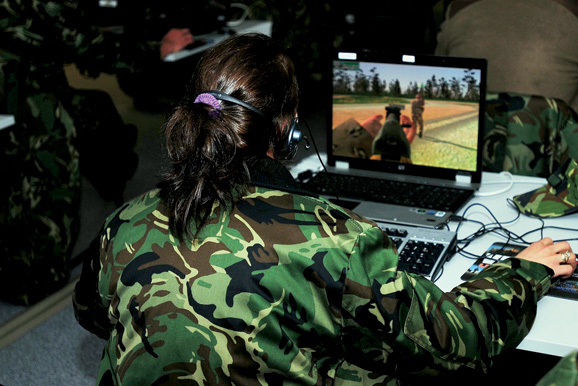 Which is why USSOCOM, and other Special Operations, are experimenting with Next Gen virtual training. These simulated environments will allow soldiers to train together, in real time, in specific environments and terrains, all over the world. The precursors of such Next Gen training simulators where showcased by CAC at the recent AUSA Institute of Land Warfare Global Force Symposium held 31 March – 2 April in Huntsville, Alabama. Manning the display at the symposium, Col. David S. Cannon with CAC explained that in recent operations in Afghanistan and Iraq, it became harder and harder for ground forces to know who the enemy was. There was much more interaction with the civilian populations, which lead to increased ambiguity and chaos in the operating environment. “The trick,” he said, “is to fight the unknown, to determine the unknown before we know it…” And he believes these simulated environments could help warfighters do just that. The technology to create the kinds of fully-immersive synthetic environments that Cannon describes (think the Holodeck on Star Trek) do not yet exist, and are not expected to be a practical reality for training until sometime “between 2023 and 2031,” however the Army does use 3D virtual simulations for training right now. The 3D Virtual Battle Space, or VBS, which is currently used to train by U.S. troops was also displayed by Cannon at AUSA.